HEINZ Ketchup 2016 Super Bowl 50 Hot Dog Commercial "Wiener Stampede"
Watch the extended version of the HEINZ Ketchup Super Bowl 50 commercial "Wiener Stampede" starring the full Heinz family and the most adorable hot dogs. There comes a time in every wiener dog’s life when you look in the full length doggy mirror and ask yourself, am I going to be a plain old boring hot dog forever? Or am I going to jump this rusty chain link fence and join the rest of the wieners in an epic stampede across the globe to seek out the most amazing tasting collection of Heinz Ketchups, so that I can be the best hot dog I can be? And that moment is a defining one, for every wiener dog. These little wieners chose wisely to Meet the Ketchups. Wiener. 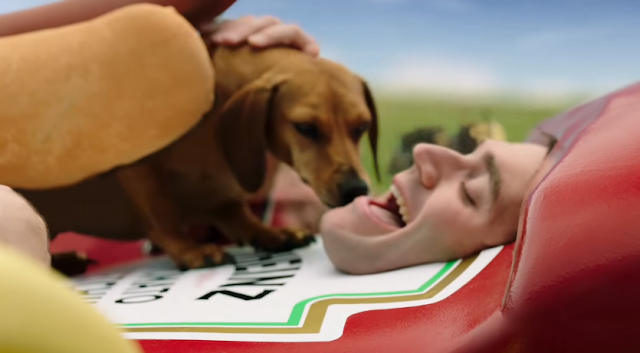 AdStasher: HEINZ Ketchup 2016 Super Bowl 50 Hot Dog Commercial "Wiener Stampede"